I need to have my apartment complex’s parking lot restriped. Is that something Benge Industries does? Absolutely. Contact us today to schedule an on-site estimate. The shopping center I manage has cracks appearing in the parking lot. What should I do? Contact us today to learn how Benge Industries can help both the appearance of your parking lot to attract customers as well as increase the life of your lot and reduce maintenance costs. When is the best time to have any cracks in pavement filled? Right away. When any crack becomes ¼-inch or wider, it will allow water to get beneath to the subsurface. This will eventually weaken the subgrade under the asphalt and the end result is pavement failure. Learn about Benge Industries crack filling and how it can extend the life of your asphalt. 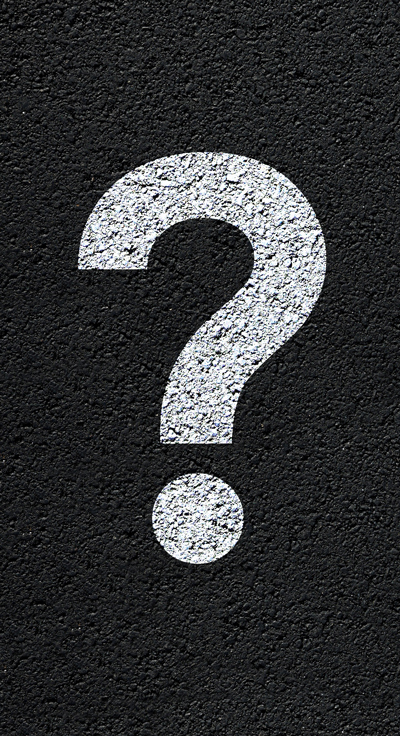 What causes asphalt to need maintenance? There are many reasons asphalt needs maintenance. Among these are: use over time, weather, poor drainage, inadequate thickness, wear-and-tear, or unstable subgrade or natural disaster. Asphalt will eventually be affected by weather and traffic and through deterioration, water penetrates the subgrade, and that leads to pavement failure. Learn about Benge Industries asphalt paving services or contact us to schedule an on-site estimate. What exactly is crack filling and what are its benefits? For proper maintenance of asphalt, crack filling is necessary. Crackfilling is the process of pouring a hot, rubberized material into asphalt cracks before sealcoating. Sealcoating provides the preservative coating and the combination of crack filling and sealcoating, your asphalt’s life will be increased dramatically. Contact Benge Industries today for an on-site estimate. What exactly is sealcoating and what are its benefits? Sealcoating is a general term for any of a variety of coal tar or asphalt emulsions applied to an asphalt surface in order to prevent damage from the sun’s ultraviolet rays, moisture from weather and oxidation. Just how effective is Sealcoating anyway? When Sealcoating is done right, it can double the life of many asphalt pavements. How long after asphalt paving can traffic be allowed on it? For asphalt repairs, you should allow 2 to 6 hours before using the newly paved area depending on the temperature. Sealcoating needs about 24-hours to cure after work is completed. Please don’t allow traffic on your recently sealcoated asphalt before the end of the 24-hour drying period. Climate, temperatures and the use of drying agents can also have an affect on the curing time. Please contact Benge Industries to learn about our maintenance services. What are some of the things I could do to prolong the life of my asphalt? Preventative maintenance solutions that we offer include sealcoating and crack filling which should be applied every 3-5 years. These services will greatly increase the longevity of your asphalt at the fraction of the cost. Benge Industries offers maintenance plans which including crackfilling, repairs of failures and potholes and sealcoating over 3-5 year cycles, depending on wear and location to help prevent asphalt deterioration from traffic and the weather elements. Contact us today to learn more or schedule an On-Site Estimate. I need to have curbs installed. Is that something Benge Indutries does? Absolutely. We specialize in extruded curb work in commercial and apartment complex settings. Contact us today to schedule an on-site estimate. Concrete flatwork is often used for dumpster pads (the area the dumpster resides) and sidewalks and driveway approaches. Benge can help with any of these kinds of concrete needs. Please call us at 503-682-9123 or email us here.